The Project | Chance auf Bildung e.V. Our grassroots partner CECIM (“Centro de Educación y Capacitación Integral Hermana Maura Clarke”) runs a broad range of educational and social projects in Ciudad Sandino, a town which grew out of refugee camps from natural disasters. It is situated close to the Nicaraguan capital Managua. 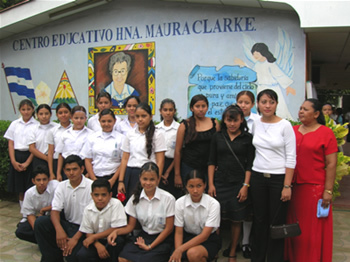 The organisation is named after Maura Clarke, a nun working for universal literacy in Latin America during the 80s. People in Ciudad Sandino live in poverty and struggle with a range of issues in their community including high unemployment, low levels of education, flawed infrastructure, high teenage pregnancy rates, crime, drug trafficking and violence. Isabel Sanchez, a Venezuelan who moved to Nicaragua during the the socialist government’s literacy campaigns in the 80s, founded CECIM in 1992 and has run it reliably and transparently since. CECIM is the centre of gravity in Ciudad Sandino. CECIM’s staff are respected in the community for their social engagement; they advise in all matters of life including health, education and family planning. CECIM motivates community members to better their lives: female empowerment courses are part of its offering alongside free night-time literacy courses, micro credits, sports, music and dance classes. In 1990s CECIM founded a private K12 school, which ‚Chance auf Bildung‘ has supported since 2004.